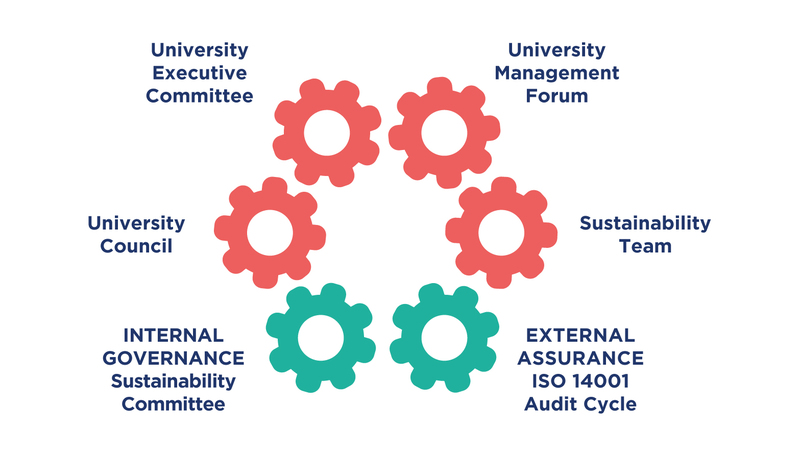 The University has a system of governance to integrate sustainability into decision-making, planning and continuous improvement. This ensures transparency in how we deliver on sustainability commitments made in our Strategic Plan 2017-2022 and Sustainability Strategy 2017-2022. The University’s Sustainability Committee (SC) meets twice a year and advises on institutional development, policy, resourcing and implementation of sustainability. It is a formal committee of the University, reporting directly to the University Executive Committee (UEC). SC membership includes representatives from professional services, academic schools, Students’ Union, Trades Unions and student representation. 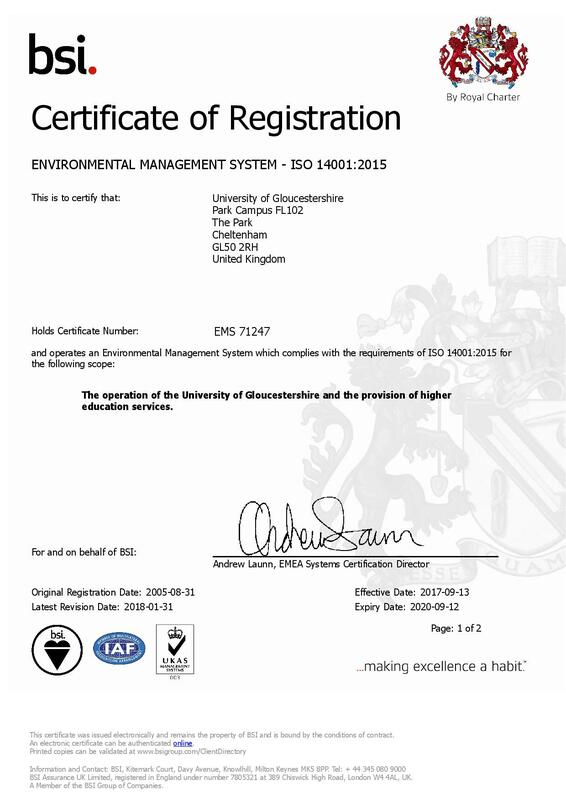 SC plays a key role in maintaining our ISO 14001 accreditation and validates the Annual Sustainability Report for the University. This expert forum takes perspective and brokers collaboration to support policy implementation across the institution on cross-cutting sustainability issues. Our sustainability governance arrangements and the operation of our environmental management system (EMS) are accredited through ISO 14001. In November 2017 we completed our registration to the new 2015 standard. The scope of our EMS covers the whole University estate – our 4 campuses at Park, Francis Close Hall, Hardwick and Oxstalls – plus all areas of business, both campus operations and academic activities. The ISO 14001 process provides external oversight of how we deliver against our key policies and plans relevant to sustainability. We also publish an Annual Sustainability Report each year which is approved by the UEC, with performance data against the SMART targets for our EMS objectives and the goals of our Sustainability Strategy 2017-2022. The Vice-Chair currently holds portfolio responsibility for sustainability on the University Council and is also a member of the Sustainability Committee (SC). She provides regular updates to Council, ensures that sustainability concerns receive due consideration in Council decision-making processes and also feeds back to the SC on relevant matters from Council. The Dean of Academic Development currently acts as the executive line manager for the Sustainability Team and ensures that the University Executive Committee (UEC) is advised of relevant issues in sustainability and that the Vice-Chancellor is regularly briefed on matters raised by the Director of Sustainability. The Director of Sustainability is a senior manager and member of the University Management Group (UMG), responsible for sustainability KPIs in the Operating Plan and delivery of the Sustainability Strategy, plus associated annual reporting duties. She also serves as Chair of the Sustainability Committee and reports on risks, compliances and reputation in sustainability.